Guess what is the talk of the town( ofcourse I mean the town where pen is life,ink is water and so on )..Well,for starters ,I think it is MontBlanc Mark Twain pen which are getting sold out like the NFL football tickets . But we have a wild entry in the town..Its the new Cross Pens. The pens hit our store more than 2 weeks back and ever since there has been lots of inquiries on the pen and the customers who purchased these pens having nothing to say about it other than good things. We sold out of the first stock we got from Cross and the next shipment just arrived today. 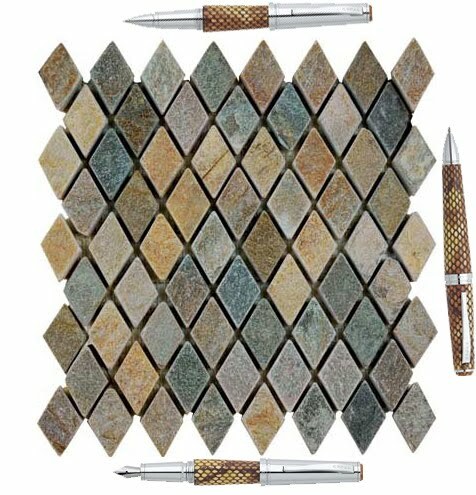 The pens are online in our website and we get many inquiries about when this pen will be put in our deal of the day .You never know..keep an alert of the page on a daily basis. Cross has released a new series named Cross Torero and Cross Edge and it is gaining popularity ,slowly but surely. 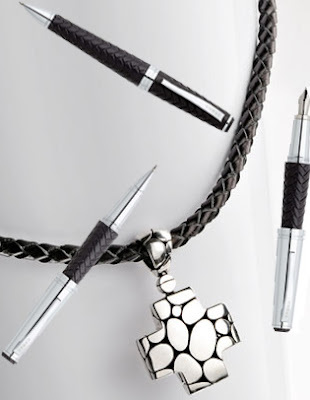 The peculiarity about Cross Torero is that the outside of the pen is covered in Leather.The grip of the pen is quite comfortable and you have a good feeling while writing it. I think many people would have doubts on the quality of leather and will it get worn out just like other leather products do. Does the warranty cover the leather? Cross did have a similar collection some time back in leather with their Cross AutoCross series.We haven’t heard any complaints about the leather of Autocross . So we believe the quality of the leather can be taken for granted. Afterall,Cross is an renowned company and would not release a product in market without rigorous testing.Also with Autocross, Cross had more variety of products like the Cross Wallet and Cufflinks. Cross discontinued the production of Autocross and they are not available any more in the market. There are various colors available (one of them Bordeaux Croc actually looks like my Samsonite briefcase,I may get that to match by briefcase ). I got curious about the name “Torero”. I googled it and came to know that a Torero is “a matador or one of the supporting team during a bull fight” . Well,why would Cross name its Pen as Torero? I never found the answer. If you have any idea,let us know. 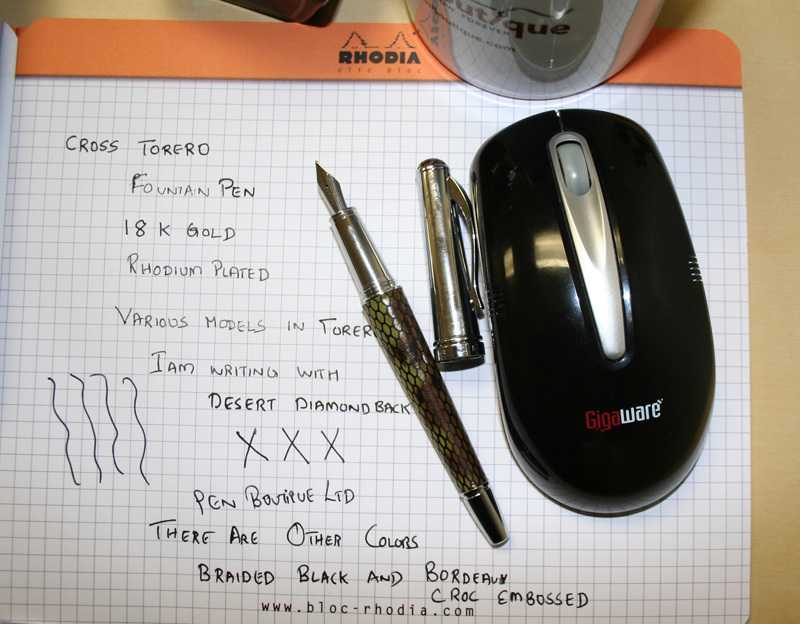 Cross Torero Ballpoint Pen is my favorite among the three.It has got rich looks and with the leather covering and has a good grip. 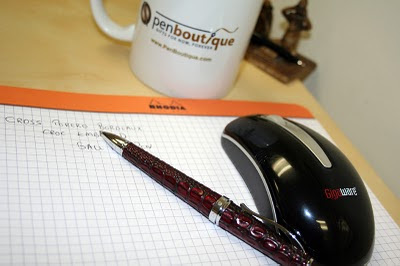 The nib is Stainless steel and is available as Fine, Medium and Broad.The Fountain pen weighs 1.48oz. Closed length is is 5.6" and open is 5.74". The clip,grip and cap are all Chrome-plated accents. Base Metal is made of of Brass. 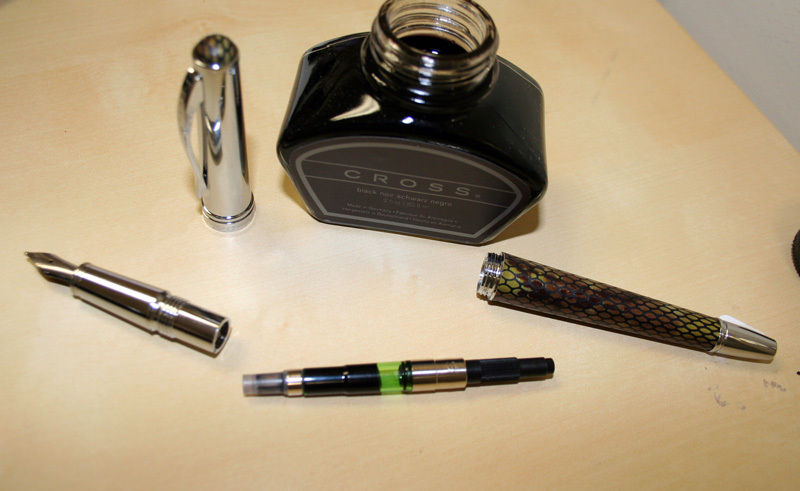 You could also use the Cross Cartridge for the Fountain Pen . As usual with all Cross Pens this comes with a Gift Box. 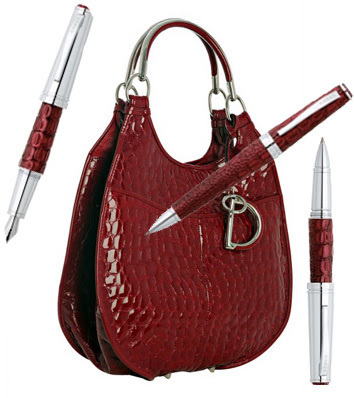 All Ballpoint,Fountain Pen and Rollerball are available in three different unique colors. Braided Black. This looks like leather being woven and could match the Neiman Marcus jewelery which has this kind of design. Desert Diamond black. – Desert Diamond is based on the color of Desert Diamonds that comes from the deserts of Arabian peninsula,primarily the central plains of Saudi Arabia. Bordeaux Croc Embossed – This one looks like the Christian Dior Handbag color . The color has a rich look and is a definite match for women who have this handbag. All said and done..Lets see how it fares in the pen world. From the looks of it there are going to be many takers of this pen. There may be many non-takers too.. But i have decided that one of them goes into my collection for sure...Guess which one?? ?